250 g ground sausage (I used sweet sausage)1 ½ tbsp. Make your favorite pie dough recipe and wrap it up in a ball. Refrigerate it for about an hour. Place 2 tbsp. of olive oil in a deep saucepan and get it hot. Add the beef and cook it up, breaking it up as it browns. Add the pork sausage and break that up too, mixing it well with the beef and getting everything nice and brown. Add the tomato paste, sugar, salt, allspice, cinnamon, nutmeg, paprika, and cayenne pepper … cooking and stirring everything for a few minutes. Add the mint and stir it in, turn off the heat, cover the pan and let it sit for a bit. In another pan, brown up the onions and black pepper in the remaining 2 tbsp. olive oil. When the onions are beginning to caramelize, turn off the heat and set the pan aside. In a small fry pan, toast the pine nuts and set them aside on a cool plate. Everything can sit for a bit at this point … so if you have other stuff to prepare, this is a good time to do it. About forty-five minutes before you want to eat, preheat the oven to 425° F.
Roll out the pie crust and place it in a small tart pan (8 or 9 inches). Leave the crust rumpled and rustic looking. Pick the bottom of the crust with a fork, line the tart pan with foil and place pie weights in the pan. Bake for 15 minutes and then remove the pie weights and foil. Continue baking until the crust is golden and completely baked – about another 15 minutes or so. Remove the pan from the oven and cool slightly. 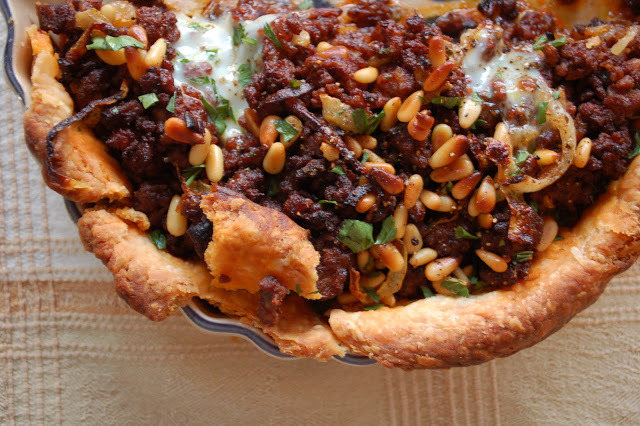 Lower the oven temperature to 375° F.
Place half the meat mixture in the bottom of the tart pan, scatter half the onions and half the pine nuts over top. Make two hollows in the mixture and break two of the eggs into the hollows, lightly tossle them with a fork – just enough to break the yolks. Layer on the other half of the meat mix, the onions and the last of the pine nuts. Make two more hollows and break the other two eggs, roughing them up a bit. Remove the pie and sprinkle on the fresh minced parsley, a bit of black pepper and drizzle with just a bit of olive oil. Serve right a way or warm.